I started with seven white peaches claiming to be from Chile. 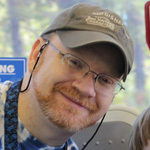 This was my first experience with this particular variety; always before, I have used yellow peaches like we grow here in Alabama and Georgia. Aside from the flesh itself being a different color (whitish to brownish), I did notice that the flesh around the pits seemed to be more "gunky" than I was accustomed to. As per the recipe, I cut my peaches into slices and put them into a pot with a cup of sugar and a tablespoon of lemon juice. Technically, I got a little more than the required four cups of fruit, but I can't imagine anyone objecting to extra filling. I find that to be safe, you can figure on getting a little more than a half cup of usable slices per peach. Peach slices, ready for boiling. 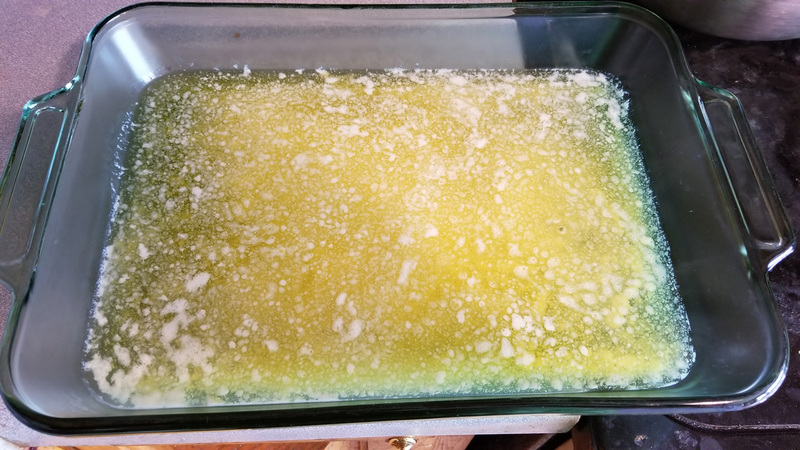 Next, I melted my stick butter in the microwave and dumped it into my baking dish. While I'm sure that you could use margarine or some other substitute, I'm a believer in the real thing when it comes to baking - so butter is what I use. You know that it's going to be tasty if is uses real butter. Mixing up the batter was the next step. You're not talking about anything complicated - flour, sugar, baking powder, and milk. 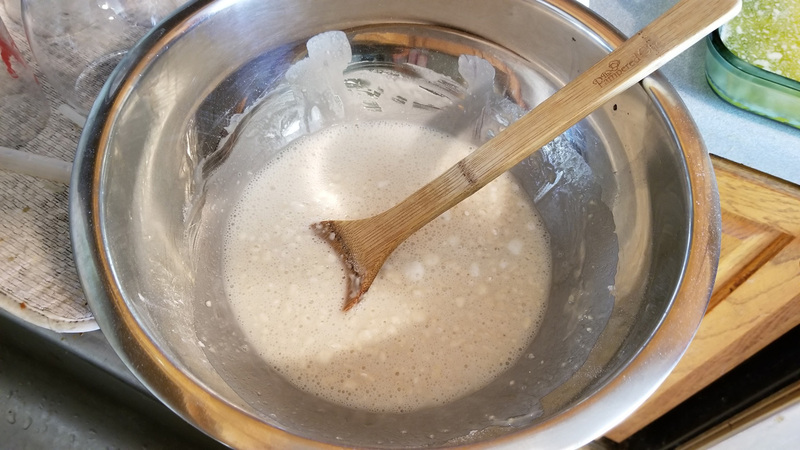 Don't over stir; simply make sure that everything is moistened with your milk and uniformly mixed. Once this was done, I brought my peach slices to a boil and stirred them for a couple of minutes. If you can use a measuring cup and a spoon, you can make this recipe. One of the big advantages to making a cobbler over a pie with similar filling is simplicity. With a pie, you have a crust to worry about, and have to be careful to do everything just so. 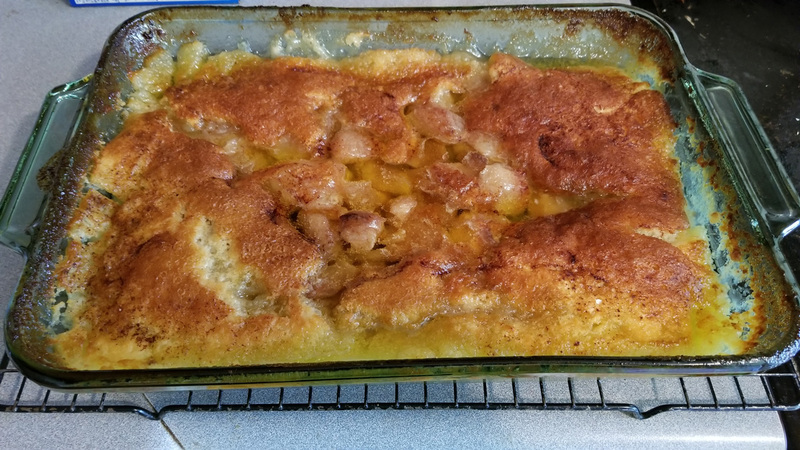 With a cobbler, you literally just dump your batter into the baking dish. If you feel like pouring it around a bit, that's fine; if you want to just dump it into one pile in the middle, it works great. Make sure to NOT stir the batter into your melted butter, as it will cause things to not turn out properly. 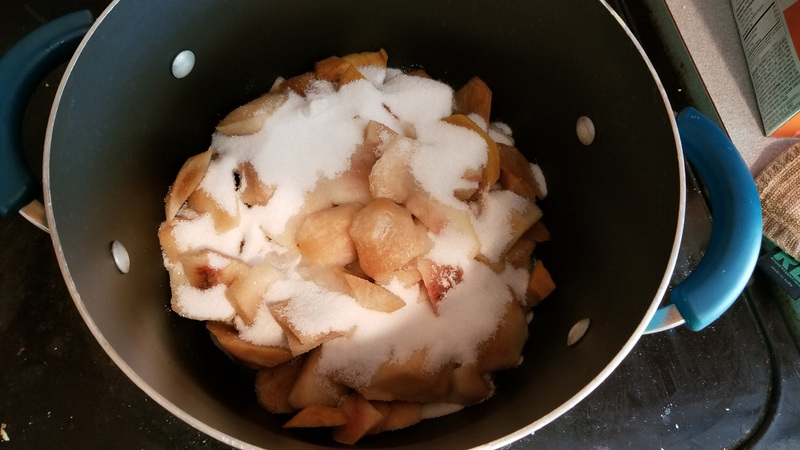 Likewise, the exact amount of time that you boil your peach slices is not super important; a couple of minutes either way won't impact the final product at all. 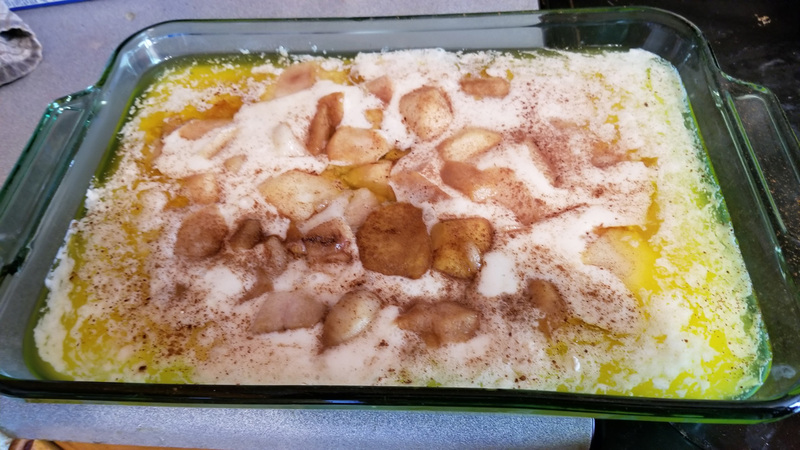 Once the batter was dumped into the butter, it was time to dump my peach slices on top of it. As with the batter, stirring is a big no-no, so I left them piled up in the middle. 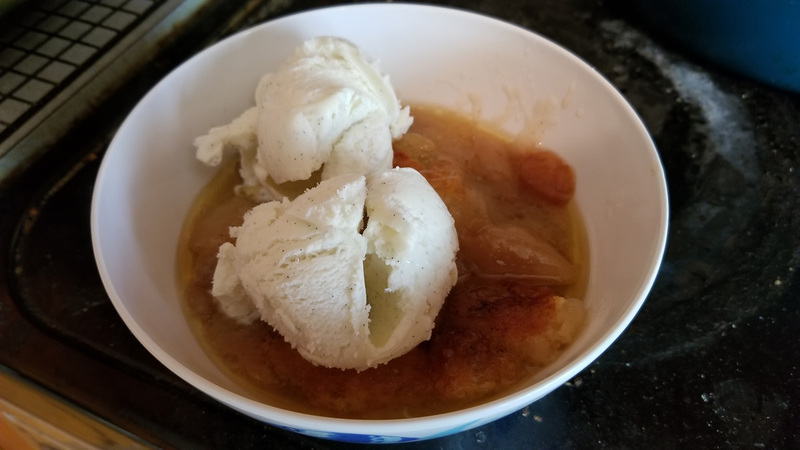 Hopefully, you weren't holding out for some complicated artistry; there was nothing left to do at this point but pop the cobbler into the over for forty minutes. Once it hit around twenty minutes, the smells started attracting people to the kitchen. Soon enough, it was ready. If you think that looks tasty... you're right. Some folks choose to let their cobbler cool before they serve it. I'm a believer in spooning it up fresh and hot, with a scoop or two of vanilla ice cream on top. 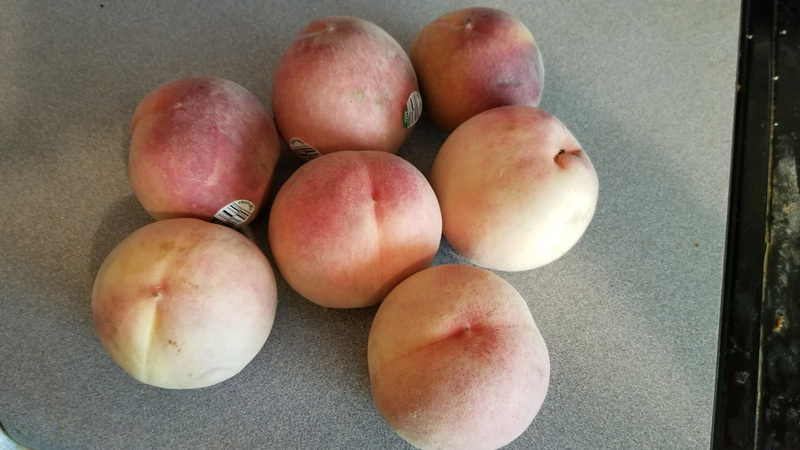 I will say that the white peaches didn't turn out quite as sweet as the yellow Southern peaches that I'm used to; in the future, I'll probably hold out for my familiar variety. Still, this dessert pretty much evaporated, much like it always does. At any rate, here is the actual recipe. Combine flour, 1 cup sugar, baking powder, and salt with your milk. Stir only until the dry ingredients are completely moistened. Pour this batter over your melted butter - but do not stir it in. Bring your remaining cup of sugar, peach slices, and lemon juice to a boil over high heat, stirring constantly. Cook for a minute or two, then pour over your batter. Again, do not stir! Bake at 375 degrees F for 40-45 minutes, or until the cobbler is golden brown. Full credit where credit is due - this is an old Southern Living recipe that you can surely find floating around the internet. It does, however, also live on in our recipe binder at home.